Dr. Neil DiSpirito is trusted and recognized in his community for providing the highest quality care in a relaxing, congenial environment. His gentle caring demeanor, and skill have resulted in the creation of beautiful, healthy smiles in countless satisfied patients. He strives to provide personalized, ethical care focused on improving your total health. Dr. DiSpirito believes educating his patients is the key to achieving this goal. He has extensive experience in a variety of services including preventive, cosmetic bonding, porcelain veneers, implant and restorative dentistry. A consummate professional, Dr. DiSpirito is committed to enriching his knowledge through extensive continuing education and his involvement in many professional associations and accredited study groups. His dedication and talent have been noted by Top Docs in America Philadelphia area, the Consumer Research Council of America, and the Delaware Valley Consumers' Checkbook. 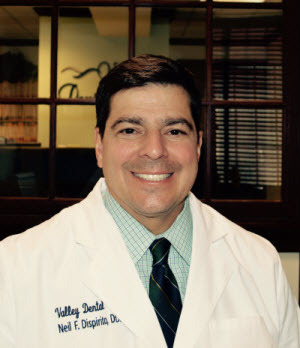 Valley Dental Care is located in the bright, comfortable setting of a beautifully restored, historic Huntingdon Valley building. To accommodate all patients, his first floor office is handicap accessible. Valley Dental Care is proud to serve residents of Montgomery, Philadelphia and Bucks county as well as their many out-of-state patients!